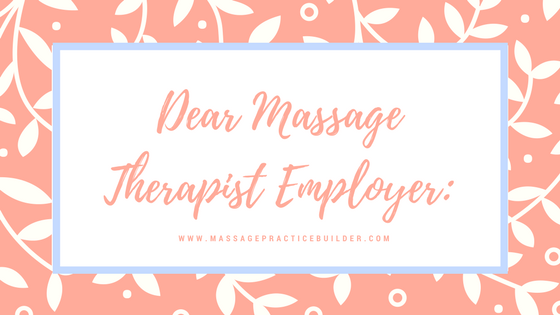 I am writing this to help create better relationships between employees and employers in the massage therapy profession. Employees are what really makes your business successful and I also want to be successful in my career in massage therapy. I am requesting that you consider some of the many things in question here to build a strong relationship. For starters, it is very very very rare that a massage therapist would be classified as an Independent contractor. If your main business is massage therapy that is an automatic out according to the US Department of Labor – you can’t be an IC if your main business is massage therapy. You may think you are saving your business money by avoiding taxes and fees, but in the long run you are hurting everyone and in the end, if/when you are caught, you risk losing your business because of having to pay ALL the back taxes and fees. You really need to consult an attorney and set up your business appropriately. I understand that you are taking a risk and opening and running this business, but I also need to be able to feed my family and make a living wage. For me that is ____ per hour. That also means I must get paid that no matter what you are charging for the session. You are obligated to absorb any group buying discounts or special offers. I can effectively provide ____(# of sessions each day) within ____ (shift hours). I prefer to have ___ amount of time in between sessions to change the table and take care of myself. I also require lunch breaks after __ amount of hours of work. If my schedule is not filled, we need to be working together to make that happen. I cannot survive on minimum wage and sitting around doing laundry. If I am cleaning and doing laundry, I expect to be paid minimum wage or higher. If I am giving a free massage to another staff member, I expect to be paid. I will stay on site for my scheduled time and expect to be paid for my time including meetings or other required functions. Please don’t deceive me in your advertising for jobs and make it sound like I will be paid more than I will actually get. I will work with your receptionist who schedules appointments and expect that appointments will be scheduled fairly to fill my schedule just as much as other employees. I expect that the full tip if any will be given to me directly. We also need adequate training and our CE paid for! Classes are too expensive on our salaries. It would also help if you pay our liability insurance too. I also need a massage each week to deal with the physical demands of the job. If I don’t get the work, the chances of injury and me being out sick, increase significantly…so getting a massage at the spa/office/clinic is essential. Make them free for employees. 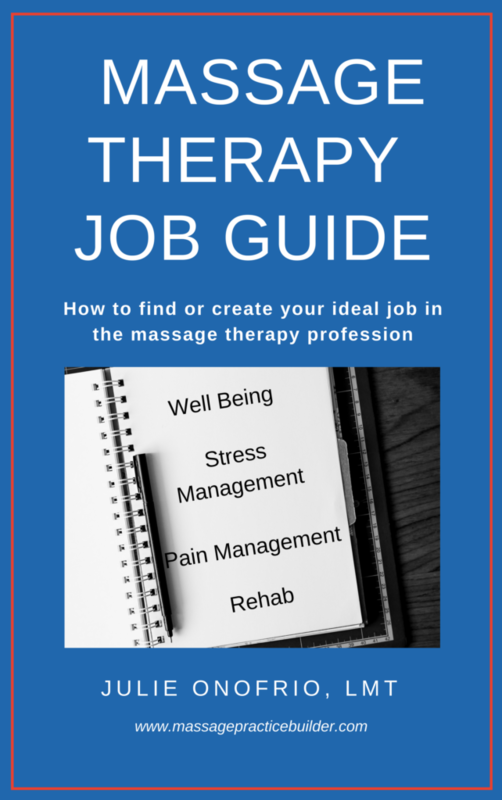 Learn how to find or create your IDEAL job in massage therapy now.